At MIT David Carr is experimenting with communicating information through taste. The project, called “Tastes Like Rain,” is built as a toothpaste dispenser attached to a microcontroller that monitors online weather data, programmed to dispense different flavors accordingly. The flavors indicate change in weather from the previous day – if the toothpaste has a mint flavor you’ll know that the weather today is colder than yesterday; if the flavor is cinnamon you’ll know the weather is warmer. PSFK » Weather Forecast Through Toothpaste. Tableau is a Twitter connected nightstand that prints photos posted to Twitter, and scans and posts hand written notes to Twitter. Tableau: physical email from John Kestner on Vimeo. prototype interactive display that takes the digital workspace from the screen to the desktop by the media computing group at RWTH aachen university. while a typical work setup combines a flat desktop with a vertical computer screen, bend desk combines the two into one single unit. bend desk is a vision for a future workspace that allows continuous interaction between both areas. using multi-touch technology, the display curves from a horizontal plane to a vertical plane. 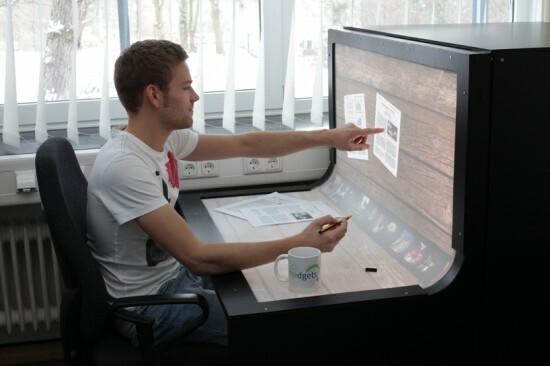 this workspace can be used to display digital content and interact with it directly using multi-touch gestures and manipulation. I see an emerging trend where the boundaries between the digital and physical worlds are being blurred. Soon we will be able to observe and interact with data through more than just the standard panes of glass of our computers and mobile phones. I have always loved writing by hand. There's something really sensually fulfilling about the act of sliding ink out onto paper. And holding a photo in your hand is a completely different experience from looking at a digital image on a screen. And the idea of tasting the weather? Fascinating. Have you experienced any examples of real world objects as interfaces? What do you think of this trend?